This is one of those dishes I have been wanting to make but, like a lot of other dishes, I only now took the time to do so as it finally hit the top of the priority list. 🙂 I’m sure glad it did because this cherry clafouti (pronounced kla-foo-TEE) is other worldly. It’s so good I even took the time to do a food stylist photo which I hardly ever do. 🙂 This makes a great presentation and is another one of those remarkably simple baked dessert recipes that even I can do. 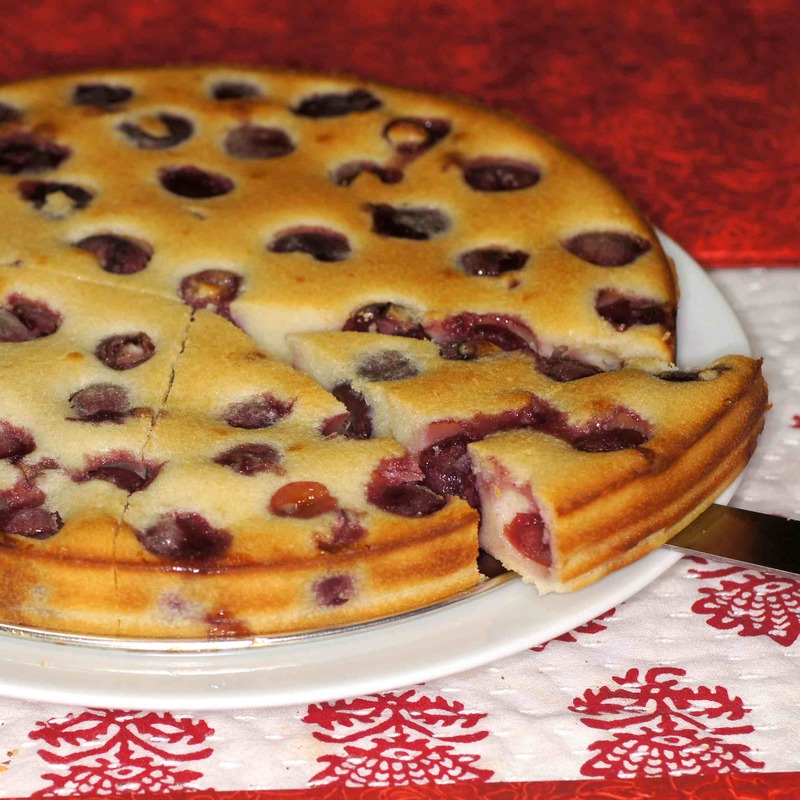 Now, a clafouti is a rustic French country dessert from the Limousin region. It has become rather popular in the US of late and you see it made with a variety of fruits, i.e. apricots, peaches, pears, and cranberries just to name a few. 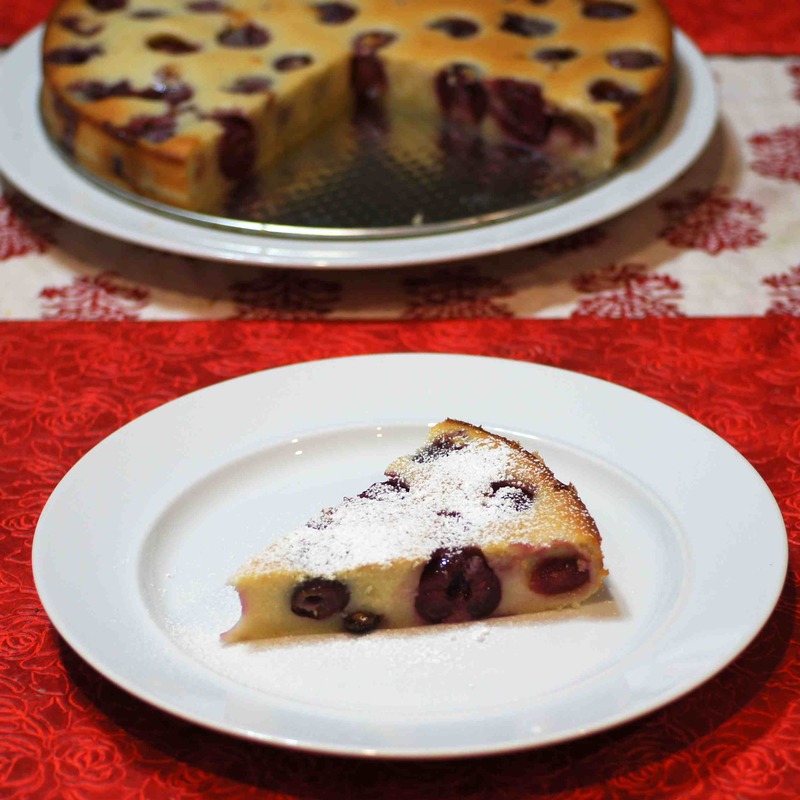 Traditionally, however, a clafouti was made with the first sweet cherries of the season. 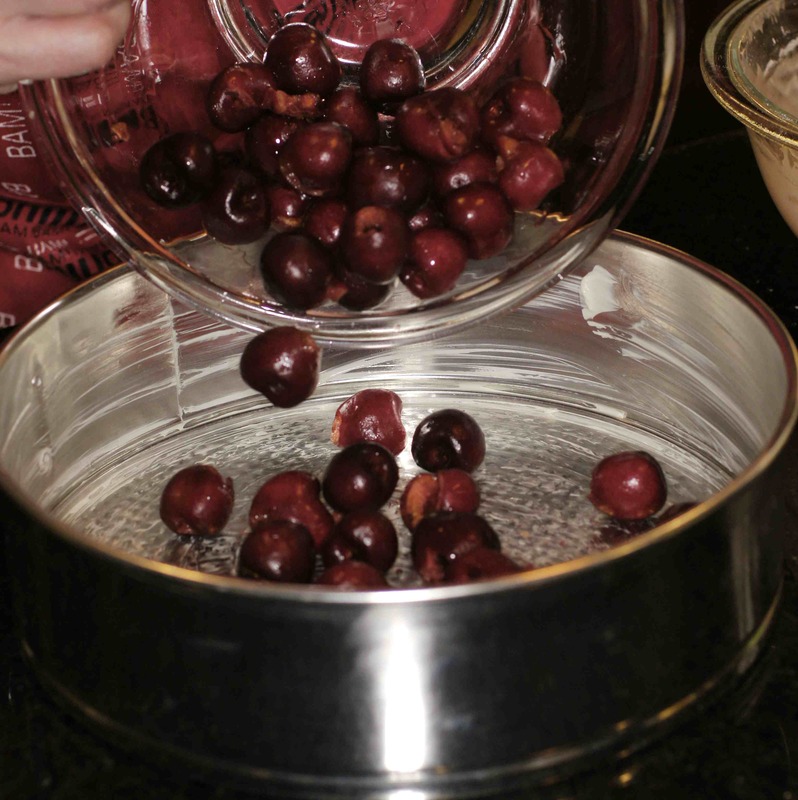 Further, the cherries were not pitted so their pits could release their delicate almond flavor as they baked. If you’re going to make it the traditional way make sure to warn your guests. Otherwise, it’s an unpleasant surprise to bite into a cherry pit. 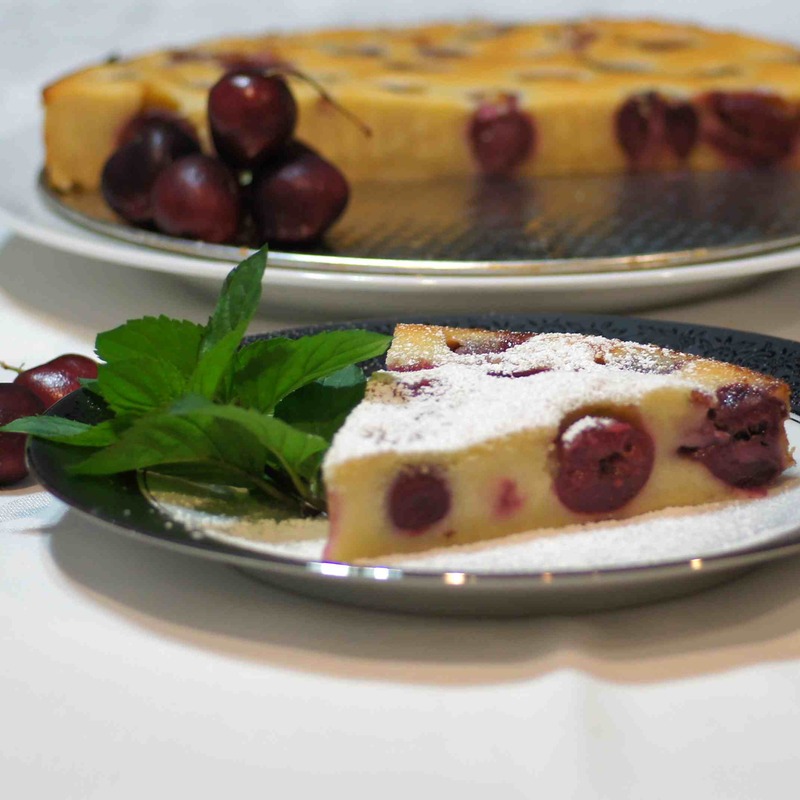 😮 Nowadays, a clafouti is made by covering sweet, pitted cherries with a pancake-like (almost crepe-like) batter and baking it in a hot oven until the batter has set with nicely browned, slightly puffed edges. 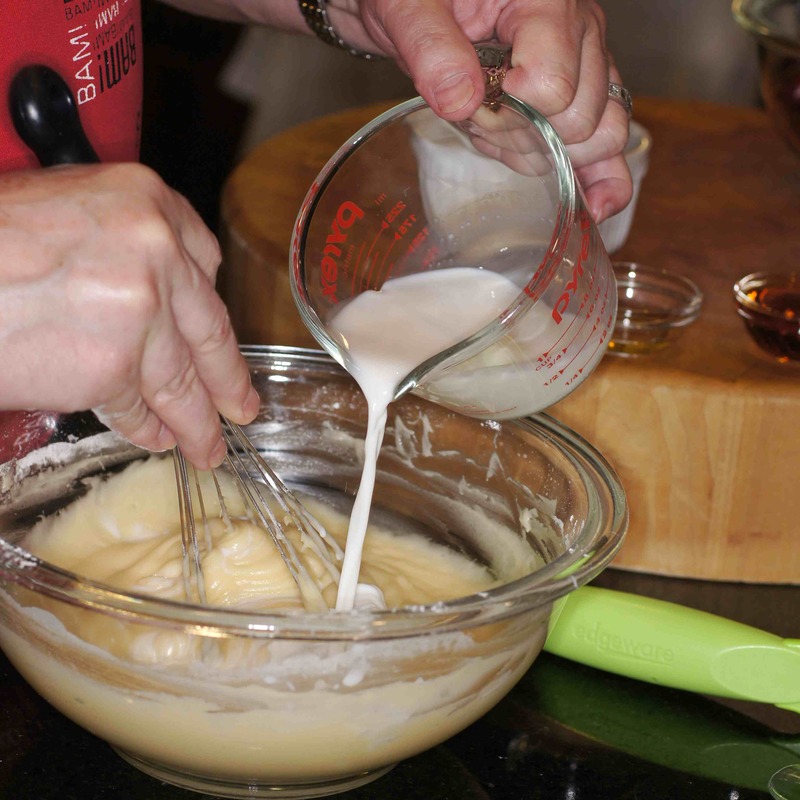 In a way, it is custardy, similar to a flan, yet the addition of flour makes it more akin to an apple pancake or a super thick, fruit filled crepe. It should be served while it is still warm with a dusting of powdered sugar. 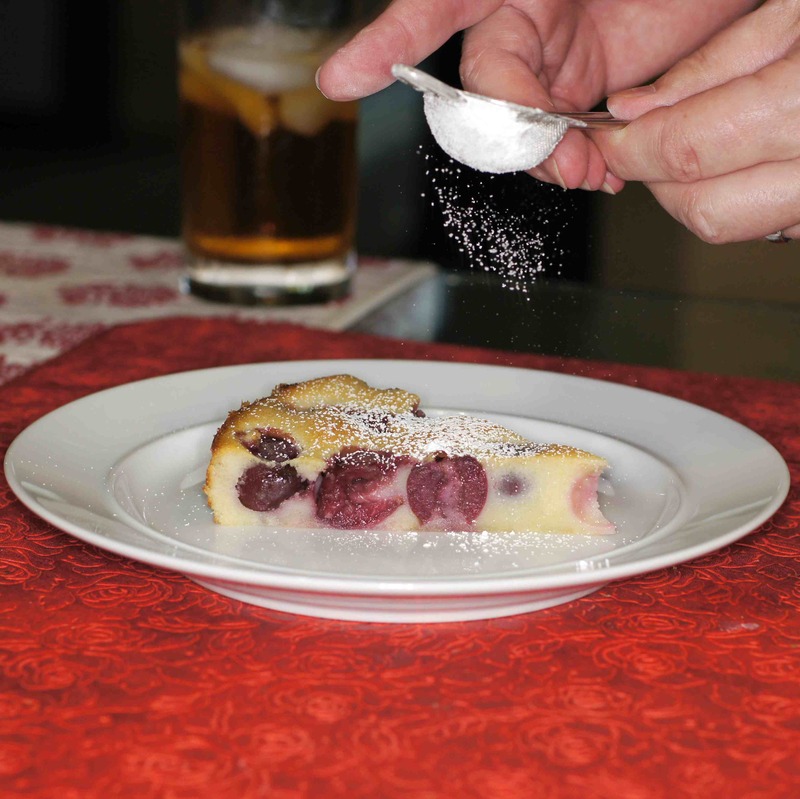 I should also point out that a clafouti is one of those dishes that is not too sweet. 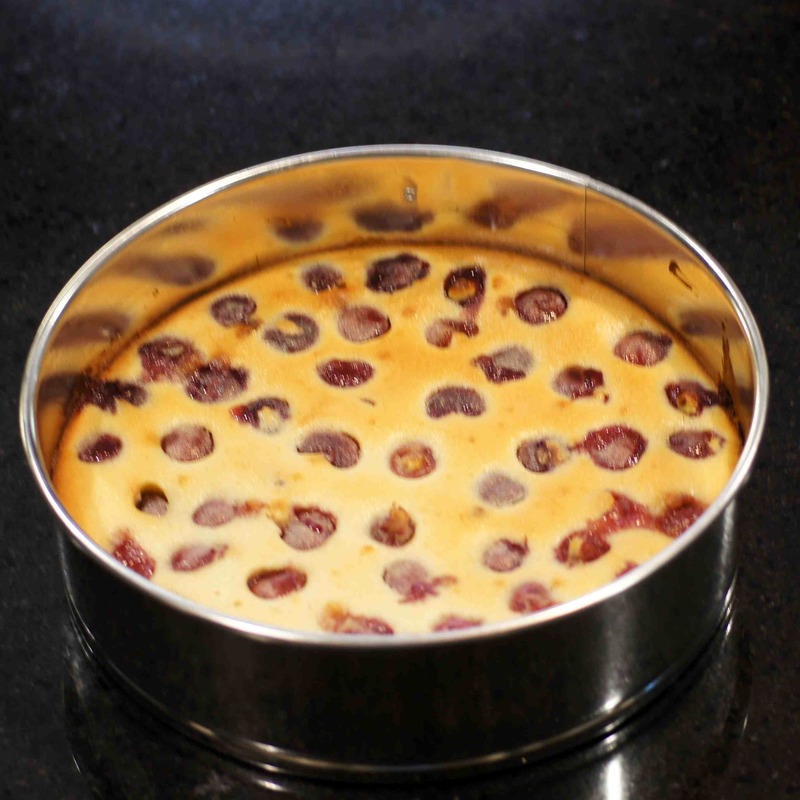 It has a delicate custard with beautiful baked cherries that really shine through. Although technically a dessert, because it is not overly sweet, you can serve it for breakfast or brunch. It has wonderful flavor, makes a stunning presentation and is bound to delight your family or guests. Give it a try. 🙂 You won’t be disappointed. Pre-heat the oven to 400 F and pit the cherries. 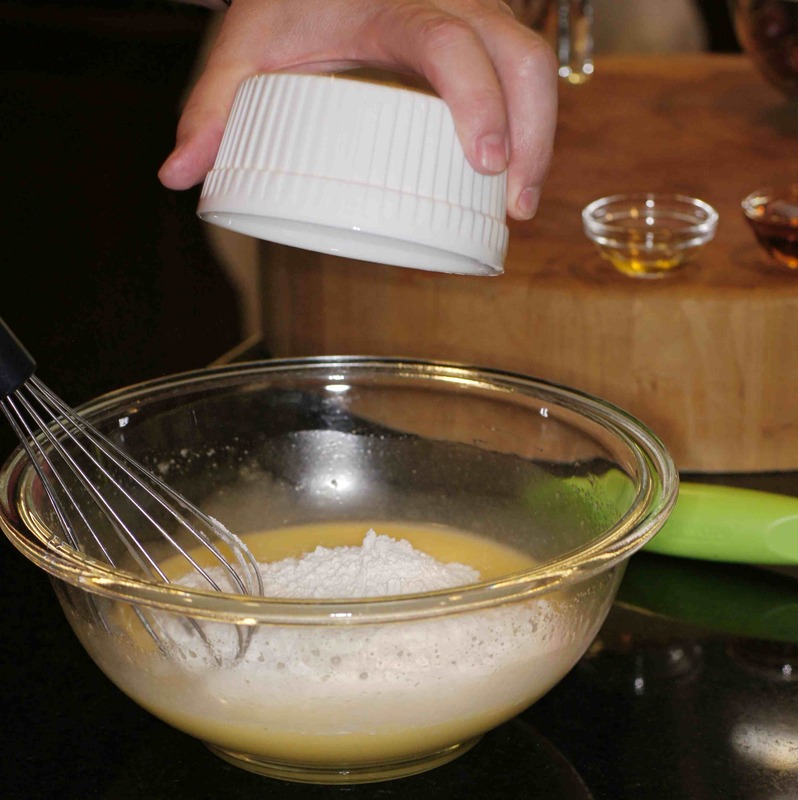 Whisk vigorously with a wire whisk until they turn lighter in color. 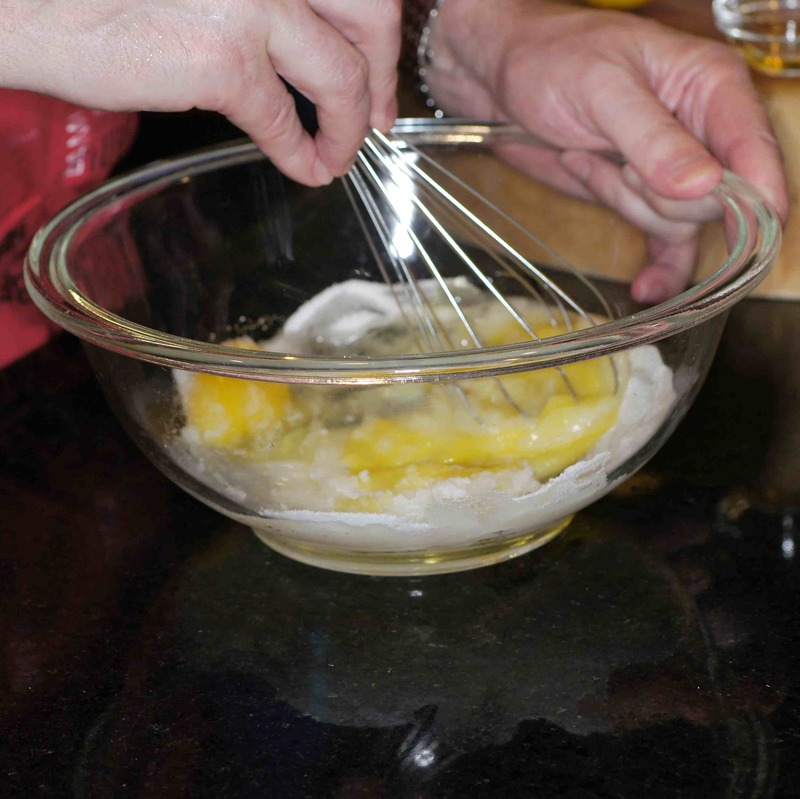 Gradually add the butter, beating to incorporate. 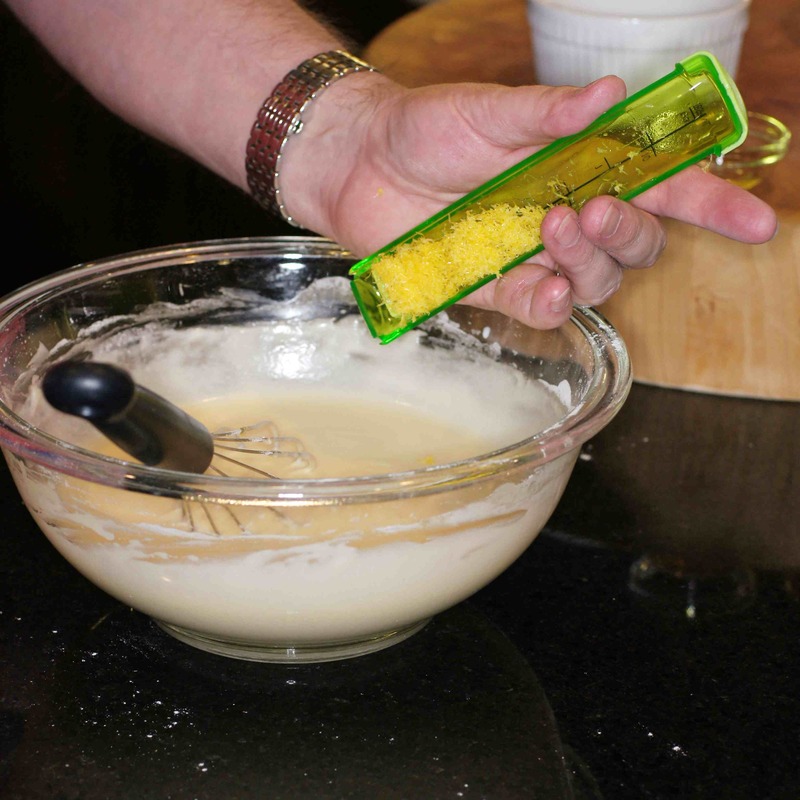 Once the butter is added and incorporated add the flour all at once. 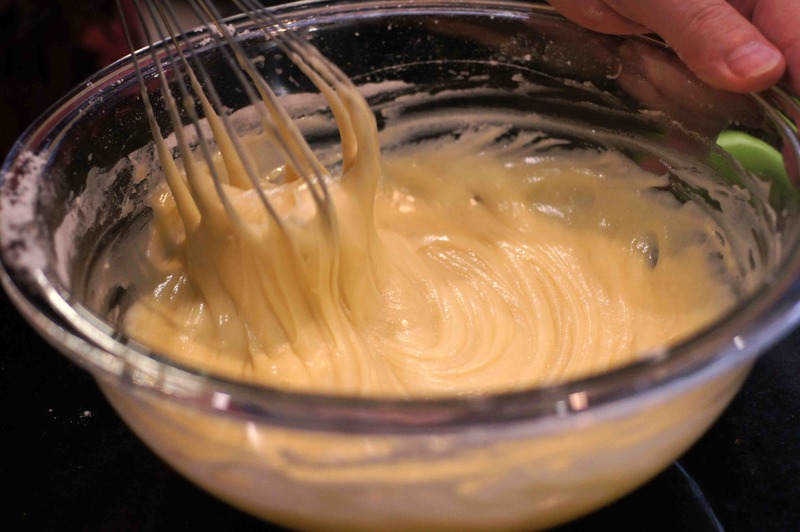 Whisk until the batter is a homogeneous mixture. Next slowly pour in the milk a little at a time. 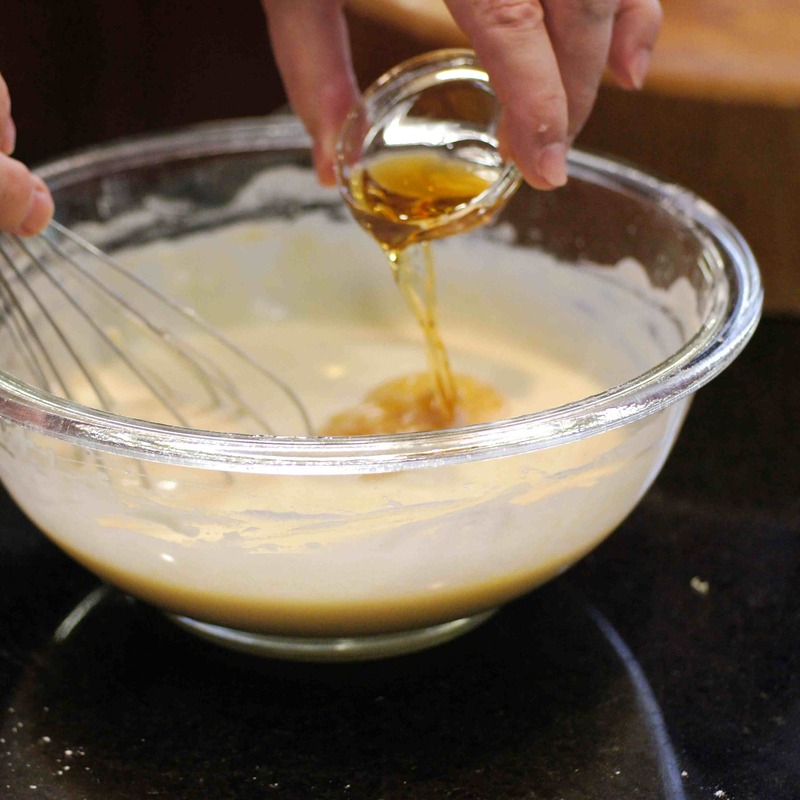 Mix well until the batter is very smooth and shiny. 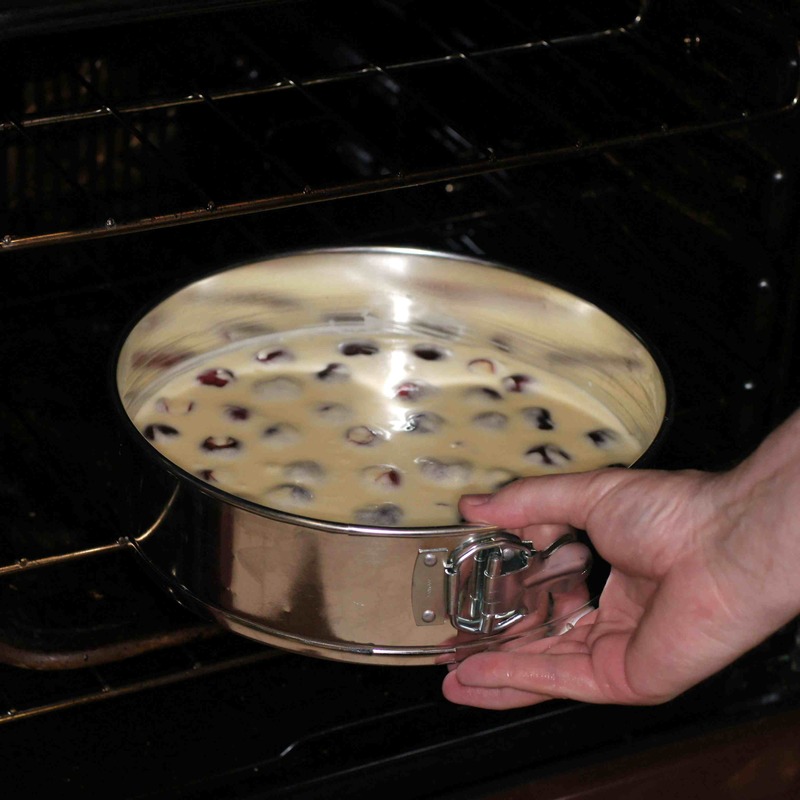 Place in oven and bake for 30 – 40 minutes until slightly browned and almost completely set in the middle. Remove from oven and let sit at least 15 minutes before removing it from pan or serving it out of the baking pan/skillet. 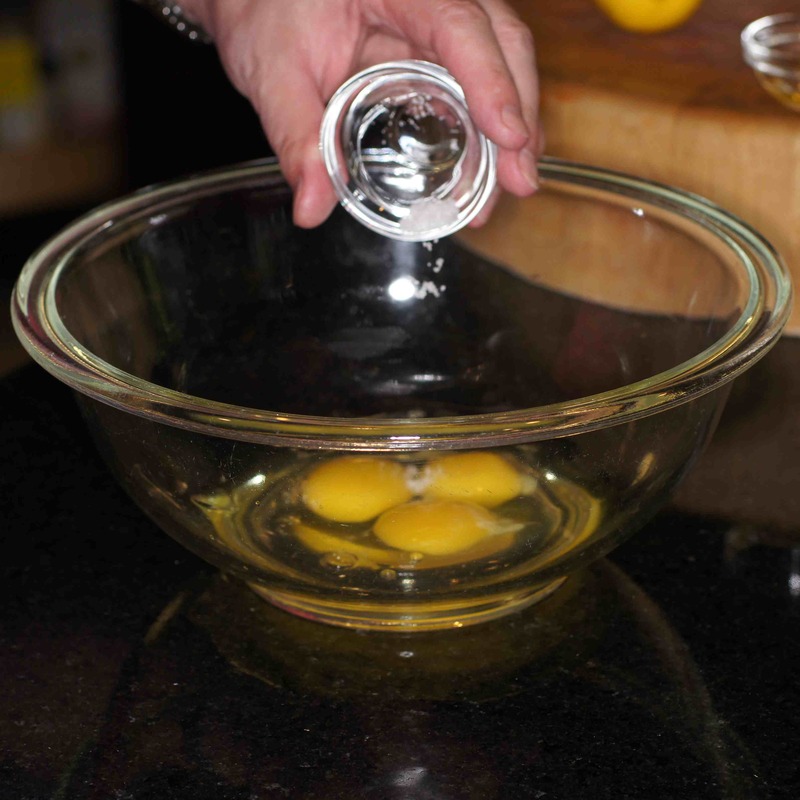 While warm or at room temperature, place on a serving plate and bring to the table. Beautiful. Interesting tidbit about the pits and the flavour they impart. Yes. There is a print button. It will print everything, including the photos. The photo did get my instant attention but that is not enough for me. I also need to taste this beautiful creation. If photos were real, I would serve a huge slice immediately. 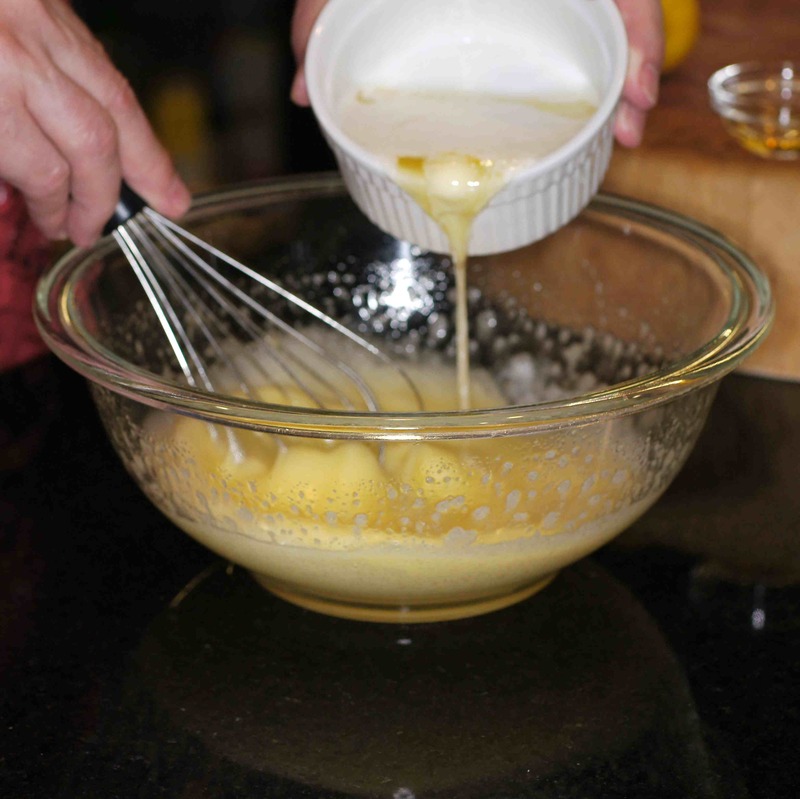 I must try this recipe, it ‘s so delectable…I really love your blog. Thanks for sharing!!! 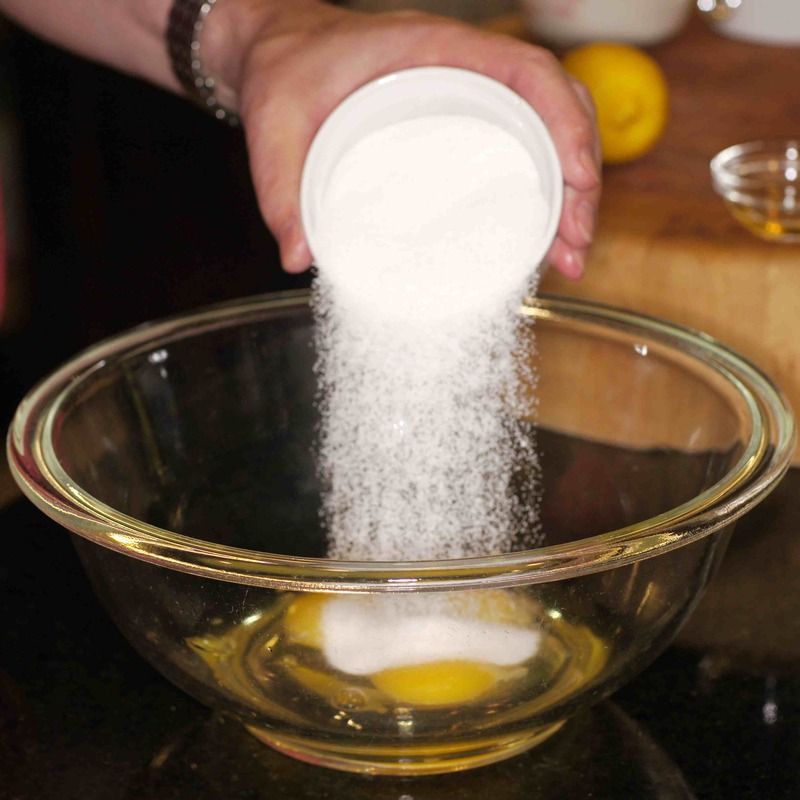 P/s what is half a cup flour in grams please? and is that two and half cups cherries? please confirm! Hi, Liz. Thanks for the very nice compliment. This definitely is a wonderful dessert. 🙂 1/2 cup all-purpose flour weighs roughly 62.5 grams and yes it is two and one-half cups fresh, dark cherries. You could probably use 3 cups in a 10 inch spring form pan. Thank you. One evening this week, I’m going to enjoy this dessert. There are lots of fresh cherries in my local store now. Gotta find a good use for them. Best wishes! 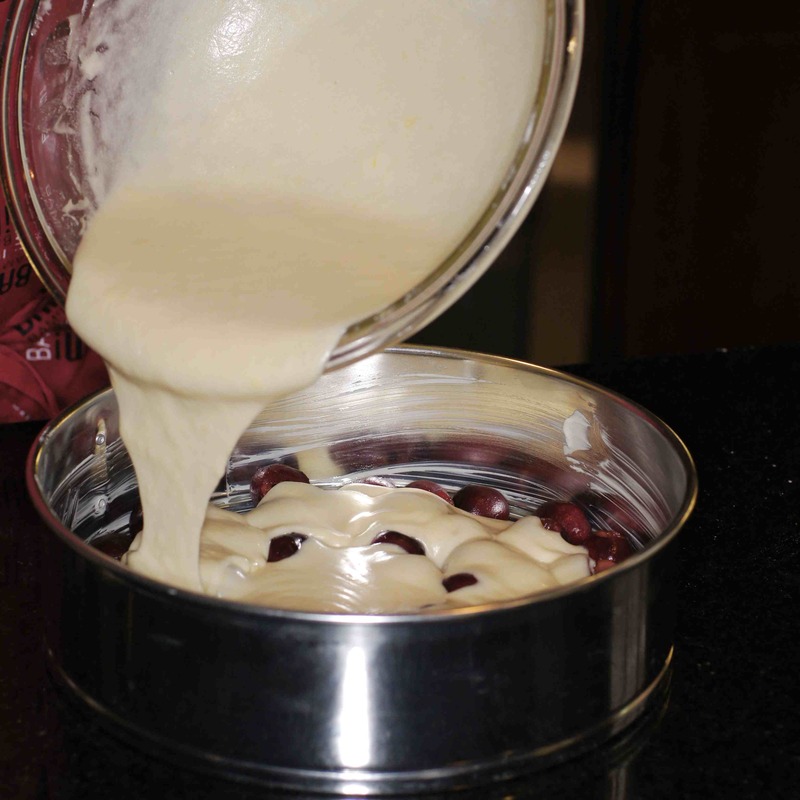 Lovely clafoutis, Richard, it looks great! 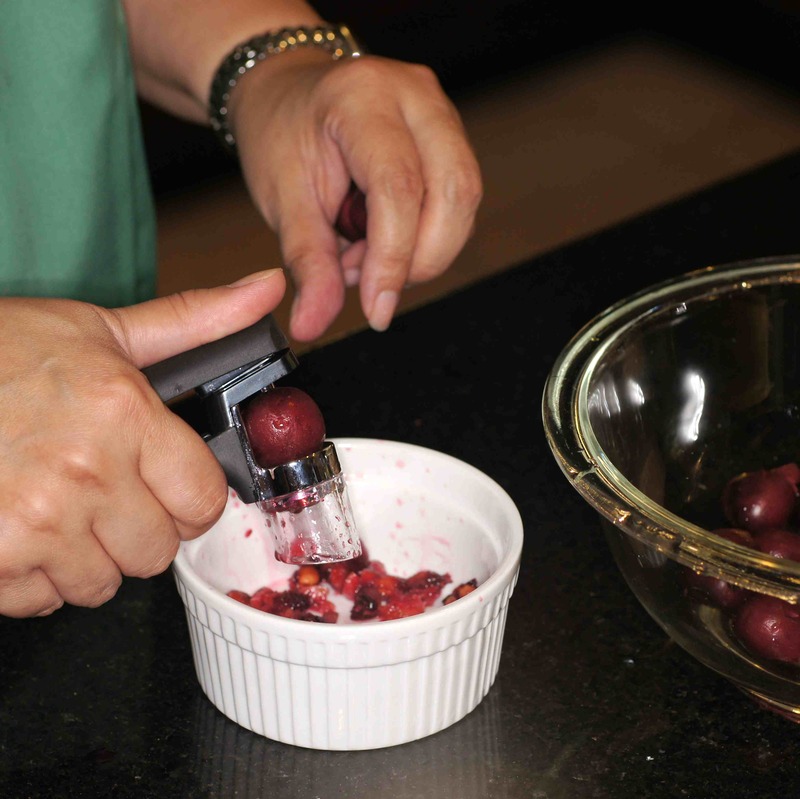 Good cherries are only available for a few days each year, but I should make an effort to prepare this again. 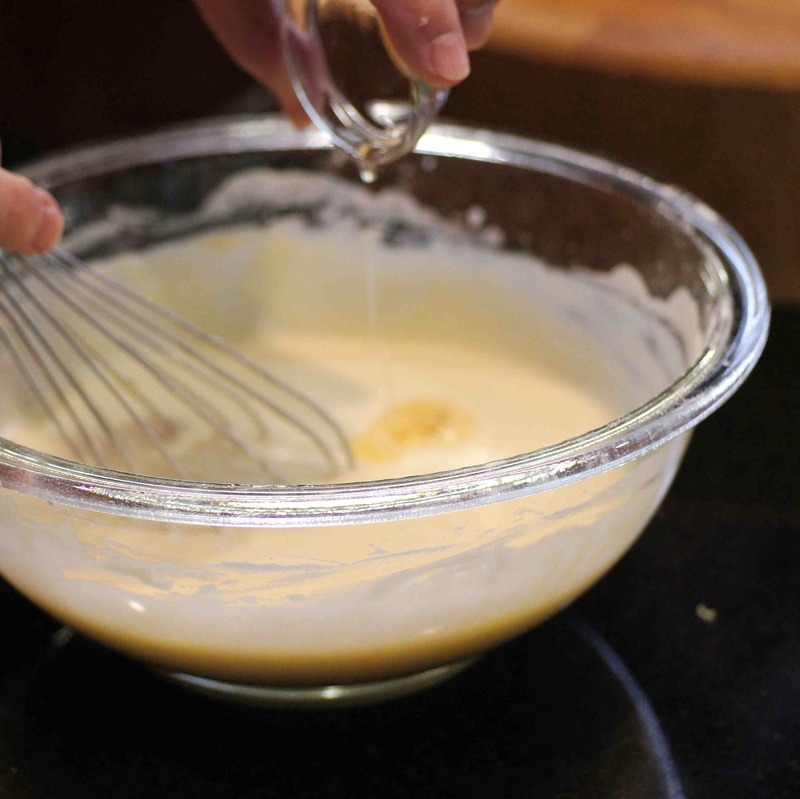 A bit of almond extract could be nice to make up for the pits 😉 Another reason for leaving the pits in is to not let the cherry juices mix with the batter, but your batter looks very ‘clean’ all the same. 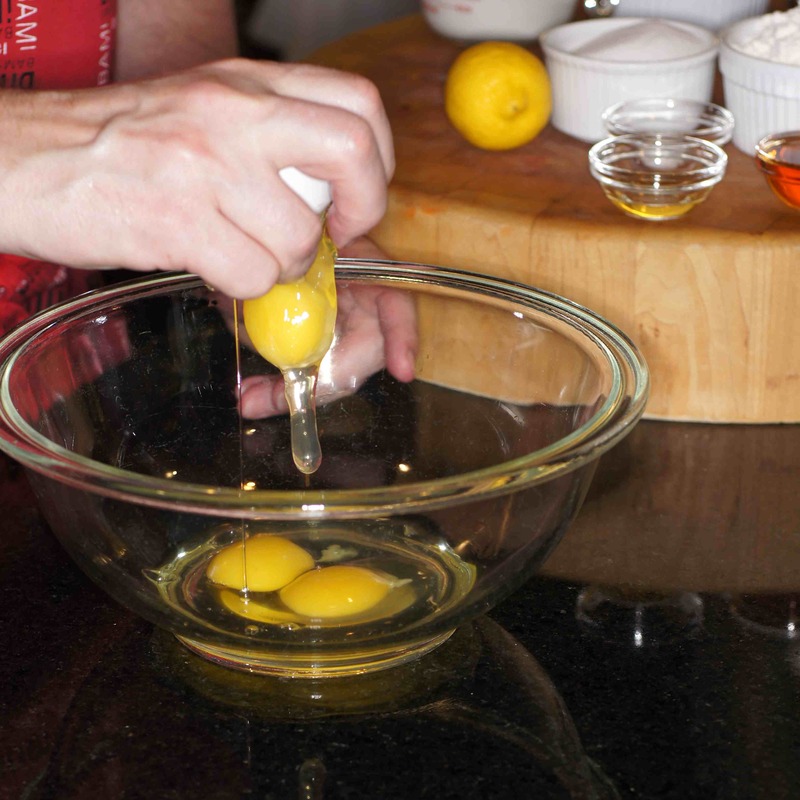 I like the addition of lemon zest, it takes most cakes to the next level. Thanks, Stefan Glad you liked it. 🙂 I thought about using Amoretto as opposed to the rum but decided to use the rum. I’m sure the almond extract would go beautifully as almonds and cherries always play well together. Oh lucky you.. 🙂 I should be able to find some too.. 🙂 but I need to buy a corer or seed remover for them..
Love the photos!!! And the recipe. Hey.. It turned out well.. A little on the sour side… But got balanced by the sweetness from the sugar… I skipped adding the mulled wine.. 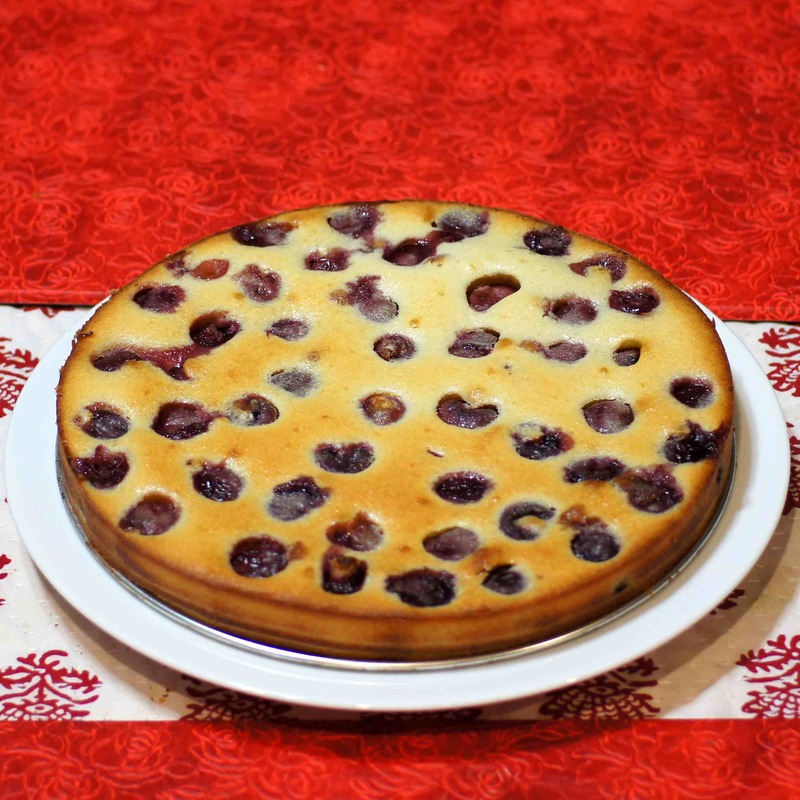 But added too many blueberries n they burst due to the heat.. 🙂 so next time will add lesser blueberries..
I’m sorry to say that your clafouti doesn’t look pretty…it looks terrific which I sure it was. It is simple and VERY TASTY. 😀 You will love it.